This inscription set into the wall below the memorial. 278945 Petty Officer Stoker Arthur Edgecombe of the Royal Navy, HMS Goliath. Son of John and Elizabeth Edgecombe (née Perring); husband of Ella Leaman Edgecombe (née Edgecombe). Born in South Milton 19 January 1875. Died 13 May 1915 aged 40. 10505 Private Bertram William Cranch of the 8th Battalion, the Devonshire Regiment. Nephew of Philip Herbert Cranch (see below). Born in Kingsbridge in 1897. Died 25 September 1915 aged 18. 224416 Able Seaman Philip Herbert Cranch of the Royal Navy, HMS Indefatigable. Son of William and Mary Ann Cranch. Born in South Milton, nr. Kingsbridge, 3 July 1885. Died 31 May 1916 at the Battle of Jutland aged 30. K14880 Leading Stoker William John Mingo of the Royal Navy, HMS Defence. 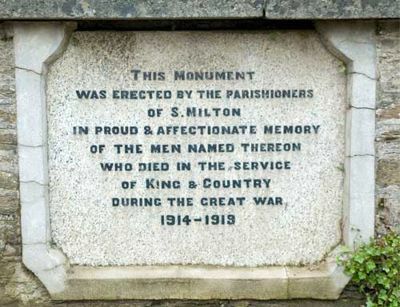 Son of John and Elizabeth Mingo of South Milton. Born in South Milton 25 October 1892. Died 31 May 1916 at the Battle of Jutland aged 24. M5200 Electrical Artificer 3rd Class Hubert Bickle of the Royal Navy, HMS Defence. Son of John and Catherine Bickle; husband of Susan Marjorie (née Lidstone) of Trendwell, South Milton. Born in Devonport 15 June 1891. Died 31 May 1916 at the Battle of Jutland aged 24. 214377 Petty Officer Andrew Deacon Luscombe of the Royal Navy, HMS Laurentic. Son of George and Emma Jane Luscombe (née Deacon) of South Milton. Born in South Milton 10 November 1883. Died 25 January 1917 aged 33. 24812 Corporal Harold Rupert Brinkworth of the 9th Battalion, the Devonshire Regiment. Son of Joseph and Ellen Brinkworth; husband of Harriet Ellen (née Ingram) of South Milton. Born in Stroud in the September Quarter of 1880. Died 6 October 1917 aged 37. The birth of Norman Reginald Weekes was registered in Kingsbridge in the December Quarter of 1897. The 1911 Census also lists this person as Norman Reginald, gives his address as Sutton, South Milton, his birthplace as Sherford and names his parents as George and Annie Weekes. 290417 Private Reginald Weekes of the Devonshire Regiment (as stated on the Memorial) is listed in the National Archive Medal Records. 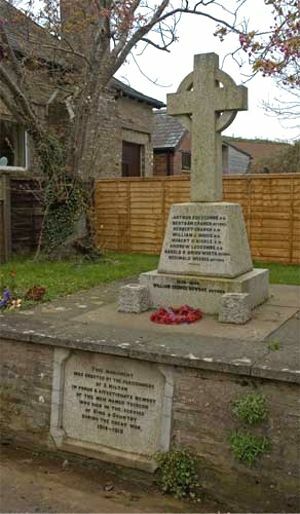 Soldiers Died lists 140553 Private Reginald Norman Weekes of the Machine Gun Corps as killed in action 25 March 1918 and mentions that he was born in Kingsbridge and transferred from the Devonshire Regiment but gives his number in that regiment as 1938. 5630878 Private William George Bowhay of the 2nd Battalion, the Devonshire Regiment. Son of George Edward and Harriet Ellen Bowhay (née Ingram) (see also the entry for Harold Brinkworth above) of South Milton. Born in the June Quarter of 1923. Died 11 July 1944 aged 21.